House Intelligence Committee ranking Democrat Adam Schiff admitted Sunday on CNN that they've still yet to find any "definitive" proof of Trump's campaign colluding with Russians. 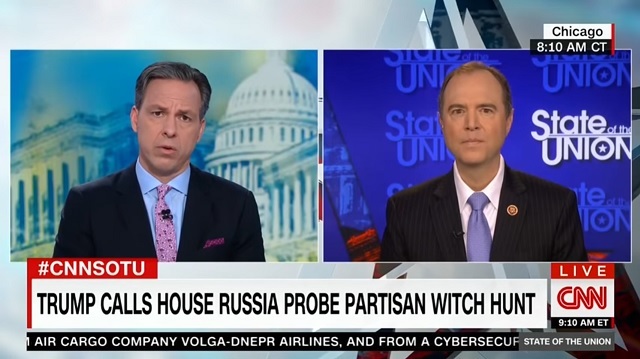 "I don't think we can say anything definitively at this point," Schiff told Jake Tapper. "We are still at the very early stages of the investigation." As Pat Buchanan said earlier this week, they've been investigating this garbage for eight months. Schiff continued: "The only thing I can say is that it would be irresponsible for us not to get to the bottom of this. We really need to find out exactly what the Russians did. Because one of the most important conclusions that the intelligence community reached is that they are going to do this again to the United States. They are doing it already in Europe. So we can say conclusively this is something that needs to be thoroughly investigated but it's way premature to be reaching conclusions." Is Russia not allowed to run a news service? Are they not allowed to lobby other governments? Pretty interesting stuff considering AIPAC just wrapped up last week and Nancy Pelosi, Chuck Schumer, Paul Ryan and Mitch McConnell went and spoke there to pledge their undying loyalty to the state of Israel (though they won't support our own president).